When I first discovered the blues in the mid ’80s, the information age was still a ways down the road. Al Gore had not even invented the internet yet. The hardest thing for me, as a neophyte listener, miles away from a blues club or festival, was finding out who and what to listen to. In most record stores, the blues section was pretty thin and there were not a lot of sources of information out there focusing on the genre, other than Living Blues, which was hard to find, even in Mississippi where it was published. For me, there were several breakthroughs that really helped me. First was the aforementioned Living Blues, which I finally was able to subscribe to (22 years and still going). Second, I became exposed to live music via the New Orleans Jazz & Heritage Festival, and a local blues festival was established within 15 miles of my home that enabled me to see some popular old and new blues acts. The third breakthrough was a mail order company called Roundup Records, which featured a ton of recordings from different labels, different genres, and different eras, plus some of the best, most informative reviews of albums both old and new that I’d ever read. I found out about Roundup from an ad in one of the JazzFest programs that I picked up in N.O., and each catalog I received from them was loaded with info about these mysterious blues artists I was in the process of discovering. One of those labels I discovered via Roundup was Black Top Records, where I discovered the music of many wonderful, nearly forgotten blues and R&B stars from 20 or 30 years earlier who were now returning to the recording studio. Over the next few years, I was fortunate enough to take in the music of artists like Anson Funderburgh and Sam Myers, Hubert Sumlin, Mighty Sam McClain, the great James “Thunderbird” Davis, and, still one of my favorite guitarists of all time, Clarence Holliman. One of my favorite Black Top releases featured Holliman and another guitar legend, Roy Gaines. 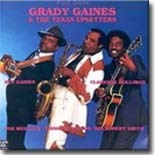 They both appeared on a fantastic album released in 1988 by Gaines’ brother, Grady Gaines and the Texas Upsetters. The album, Full Gain, was set up similar to those R&B revues of the ’50s, with different musicians taking center stage behind the same band. Most of the artists were from the Houston area, veterans of the Duke/Peacock Records recording days, but there were also a few musicians from New Orleans, with impressive history behind them as well. Full Gain also featured several other Houston legends. Holliman had started with Charles Brown at 17 and played guitar on many Bland sessions. Teddy Reynolds had played piano for Bland. Trumpet player Floyd Arceneaux played for Ray Charles and Chuck Willis, and singer Big Robert Smith was a mainstay of the Houston music scene. However, the real catch for the session was Joe Medwick. Medwick had provided many songs for Bland during the Duke glory years (“Farther Up The Road,” “Cry Cry Cry,” “I Pity The Fool,” “Yield Not To Temptation”) and even demo-ed most of the songs for Bland. Duke/Peacock head man Don Robey bought these songs from Medwick for a pittance, listed himself as composer (using the name Deadric Malone), and cashed in on the royalties himself. Medwick had been been away from the blues scene in Houston for so long that a lot of people presumed he was dead, so his re-emergence was a major event. Medwick brought three songs to the session. There’s no doubt that “If I Don’t Get Involved” would have been a hit for Bobby “Blue” Bland back in the day had he gotten the chance to record it (he actually did record it for Malaco a few years after Full Gain). Medwick himself turns in an outstanding performance on the song. He also wrote and sang “Your Girlfriend,” and his composition, “If I Loved You A Little Less” is sung by Big Robert Smith. Not to be outdone on his own album, Grady Gaines turns in an exemplary performance, nearly blowing the roof off the building with his saxophone on a scorching set of instrumentals (“Full Gain,” King Curtis’ “Soul Twist,” and the old New Orleans R&B chestnut, “There Is Something On Your Mind”). Hollimon provides plenty of tasteful, stinging leads throughout, as he would continue to do for the duration of Black Top’s existence. Grady Gaines would release a follow-up a few years later. Although Roy Gaines didn’t play on the second release (Anson Funderburgh filled his spot), and Joe Medwick passed away from liver cancer before the project was undertaken, Horn of Plenty was a strong release. We’ll be looking at it in a few months. Soon afterward, Black Top was gone as well, going under in the late 1990s. In recent years, there have been some efforts to reissue many of these recordings by several labels. Hopefully, they will get around to Full Gain sooner than later. All contents Copyright © 2010, Blue Night Productions. All rights reserved.